Looking for the best groundhog and woodchuck traps in 2019? Then you're in the right place! Havahart has made a name for itself in pest control—specifically when it comes to trapping nuisance animals. Their 1045 Live Animal Two-Door Trap is no exception: its strong steel mesh won't collect rust along the outer layer and its inside is smooth enough not to harm the woodchuck it traps. Here's how the trap works: a spring-loaded panel is located on the inside of the box-shaped trap. This is otherwise known as the "bait station," because this is where you'll want to place a tasty treat to entice a groundhog to run into your trap. Once the groundhog smells the bait and steps inside (putting weight onto the spring), the doors of the trap will snap shut, locking the animal inside. This trap comes totally pre-assembled, and is a breeze for you to set each time you're ready to catch a groundhog. Just take a look at the video below—it takes less than a minute from start to finish! Please remember that groundhog traps are not always totally effective, and some crafty woodchucks will not be attracted to the materials. If you're interested in learning more about groundhog traps or want to read more about the other products we considered, see below! What Is a Groundhog Trap, Exactly? Are Traps And Baits Sold Together? How Much Does a Trap Usually Cost? A groundhog trap is a device designed to capture groundhogs, also called woodchucks. Most of these traps look like small cages which have a mechanism to trap the animal inside. How Do Groundhog Traps Work? Most traps have an interior panel, switch, or lever which is activated by the groundhog when they walk inside. Once they activate the mechanism, the door behind the woodchuck swings shut, trapping the creature. The user of the trap will need to reset the mechanism once they release the groundhog. Most of these devices require the owner to use some form of bait. For groundhogs, it's possible to use fragrant fruits and vegetables like green beans and watermelon. Read Also: What are the best baits for groundhogs? What Are the Risks of Using a Trap? Trapping a groundhog with regular cages pose little to no risks. The user just needs to make sure they wear proper safety gear when handling the cage that has a groundhog in it, since these animals might use their powerful teeth (called incisors) to harm you. Wildlife experts recommend that people wear full gloves, sleeves, and maybe some eye protection. Even though bait and traps go together as one thought in peoples' minds, they're actually two separate products. Buyers will need to purchase their own bait since the traps are sold separately. See Also: How to pick the best groundhog baits? 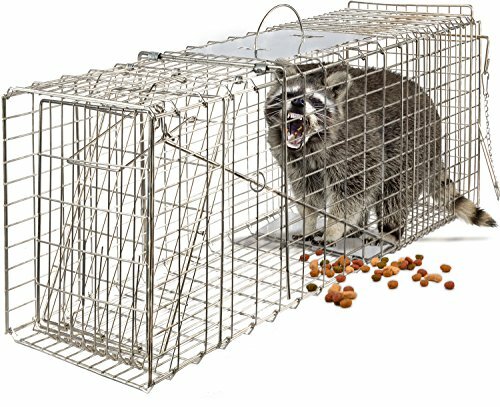 All of the traps on the list can be baited by simply placing the preferred food inside of the cage beyond a pressure plate or trigger. Traps come in a lot of shapes and sizes. Because of the different variables at stake, it's impossible to nail down a specific price point for each and every trap—that's almost like asking how much houses cost! However, here's the good news: in our buying guide below, we list up-to-date pricing for each and every product. Be sure to click the links in the product descriptions to learn more about each individual product price. In general, groundhog traps do work when set up properly. Individuals who use one need to know that it might take several days for the woodchuck to enter. Some animals will also prefer one type of bait over another, so there is some experimentation involved. The Havahart 1045 is one a the most popular live traps on the market, and for good reason: it's a solid, reliable, and durable trap which gets the job done safely and efficiently. The interior features smooth edges so the captured groundhog or other animal doesn't hurt itself. This trap comes fully assembled upon purchase and requires little to no setup, since the doors on either side just needs to be set. The metal resists rust and is unlikely to corrode, regardless of how long it sits outside in the elements. The wire is thick enough that the groundhog can't bite through it, despite the strength of their incisors. This product features a system of two spring-loaded doors, which make it simple to catch and release the groundhog in a secure location. The trap is secure, and has an external handle so that it can be picked up and the groundhog released safely in a separate location. 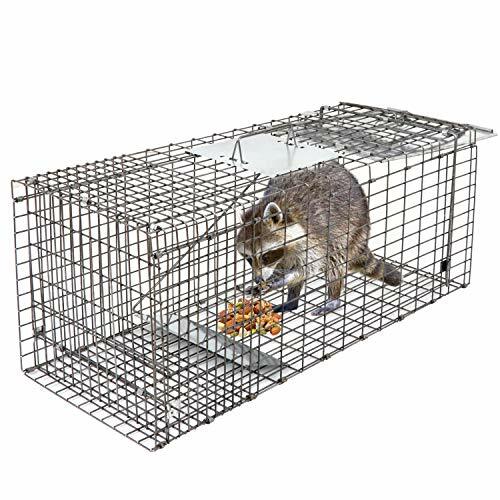 In addition to groundhogs, you can trap raccoons, opossums, and even feral cats with this trap. We recommend this trap to those who are looking for an excellent all-around groundhog trap to use year after year and get the job done right. The Smartxchoices Collapsible Trap comes to the buyer fully assembled and possesses smooth internal edges so the groundhog that enters isn't hurt. The best part: when you're not actively using this trap, simply collapse it down and slide it away—it deflates to a fraction of its size! The trap is made of sturdy metal wire and has a smaller mesh door so animals can't just walk in and steal the bait instead of being captured. The cage is smaller than some others, but still gets the job done well. The Smartxchoices Collapsible Trap features an external handle so the user can carry the captured groundhog to a new location for release. We recommend this trap to people who want an inexpensive option that is still effective, as well as to those who don't have a ton of storage space but need a reliable groundhog trap. The HomGarden Humane Trap is a smaller, inexpensive groundhog cage which has two separate doors: one where the woodchuck enters and one through which it can exit. This trap costs significantly less than other traps on the market, which is a major reason why we like it so much. It gets the job done just as well as these big-name traps, but at a sliver of the price! The HomGarden Humane Trap can hold one groundhog at a time and has a spring-loaded door which won't be triggered by the human user or any children. The HomGarden is easy to set up and made of metal. It is relatively water- and rustproof, and is easy for the user to carry to release a groundhog. We recommend this product to individuals interested in an inexpensive trap to catch smaller woodchucks. The Oxgord Live Animal Trap is a durable and tough live animal trap which has one door set on a spring attached to the baiting station. The metal is rust resistant (despite elemental exposure) and has smooth interior edges to keep the groundhog from hurting itself. This trap is large enough to trap even the biggest groundhogs, and can even trap other nuisance animals in the yard as well! If you've got feral cats, opossums, raccoons, or hares, this is the trap for you. 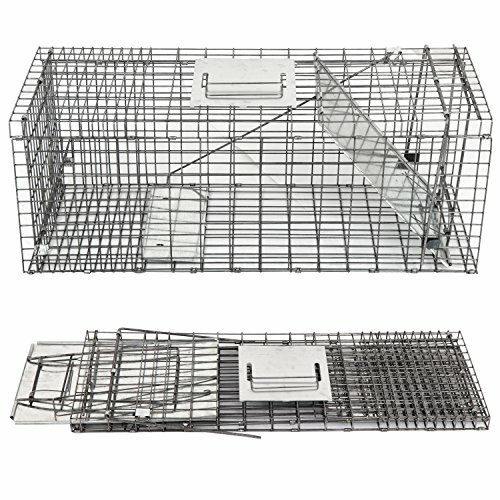 We recommend this trap to people who want a reliable cage that is large enough to trap even the fattest of groundhogs. When you find your yard full of groundhog holes, people will have a different reaction. Some will instantly want to eliminate the groundhog, while others will go for a more humane approach. Want to learn more about groundhog removal? Check out these other helpful guides!